Ever had a really good meal? I mean REALLY, REALLY good meal? As a travel blogger, I'm often asked about my best travel meals ever, of which I've had many. A transcendent meal is one of the great human experiences! Growing up in my grandmother's kitchen, I learned the true value of good food. A great meal is about more than just the flavors on the plate. Attention to detail, the atmosphere, and the company you keep at the table all play a role in making a good meal great. I've written a quick list of my best travel meals and where to recreate them for all my fellow travelers. Cheers to good food, good wine, and good times! By far my BEST travel meal ever is one that can never be recreated, by you, me or anyone else. It's a meal I shared with my beau at a random cafe in the heart of Dijon, France. We'd set off from our lodging in search of a restaurant which turned out to be closed. Luckily, we found our way to another cafe and had the meal of a lifetime. Long story short, we'd walked a very long way to find a place to eat. We were tired, hungry, and starting to bicker. When we finally stumbled on a cute little cafe, we "settled" for what we hoped would be an authentic dining experience. What happened next was amazing! We shared a spectacular meal of hand-made charcuterie, delicious cornichons, fresh baguette and killer Burgundy. It was exactly what we had hoped to find at the other restaurant and more. We'll never forget how that meal tasted, how we felt before and after, or how we found it. It's etched in our minds, unnamed and unmarked on any list or site. For that reason, it's at the top of my list of the best travel meals ever. But there's plenty more where that came from! Over the past several years, I've had the good fortune to experience some stellar meals. Below are a few of my best travel meals ever (in no particular order). Today, I share those with you in hopes that you are inspired to seek your own good food fortune! You'll find that I've added Trip Advisor & Yelp links to each of the restaurants listed in this post. Be sure to bookmark each one to add to future travel plans. Or simply pin this post to your favorite Pinterest travel board so you can easily recreate some of our travel meal experiences. Located in LA's hip Melrose District, Chi Spacca is a meat-lovers dream. Space is limited, so reservations are a must. It's a great option for special occasions (we went for my birthday) because of the quiet, intimate atmosphere. This meat-centric menu is ideal for the carnivore in the family, so be sure to explore the menu first if you're not a fan of meat. For me, the highlight was the in-house salumeria...absolutely nothing beats a good charcuterie board in my book. Sacrée Fleur is the ideal quiet little Paris cafe. Owned and operated by a lovely couple (who also serve), the small menu packs big punches. The quiet, dark space is super romantical. I really love the neighborhood feel of this place, too. We got a tip from a local and rushed to snag a table for two. It was here that we had the best beef tartare EVER. Hand mixed at the table, it was the most delectable treat coupled with my first ever taste of Parisian frites. Houston (Texas) isn't where I expected to find an amazing meal, but boy was I wrong! Located near Rice University, Hugo's, upscale Mexican restaurant, blew my mind. The octopus ceviche was literally one of the best things I've ever put in my mouth. Terracotta tiles, colorful ceramics, and delicious margaritas made the meal even better. Located in the Warehouse District of New Orleans, Cochon offers diners a pork-centered menu in an upscale yet casual atmosphere. FYI, reservations are required. But don't worry if there are no tables to be had. Just walk around the corner to Butcher for a taste of the porky goodness deli-style! I went to Rome (Italy) with one mission: a good raviolo. I found that and more at Cantina Cantarini. Fresh ricotta + Sage brown butter + Freshly grated parmesan = Mission accomplished. Sit street-side for a glimpse at Roman daily life, for this spot is tucked away from tourists in a more residential area. Locally sourced meats and fish make this changing menu worthwhile. The history (first opened in 1903) is remarkable, and the tradition shines through in the service and the food. 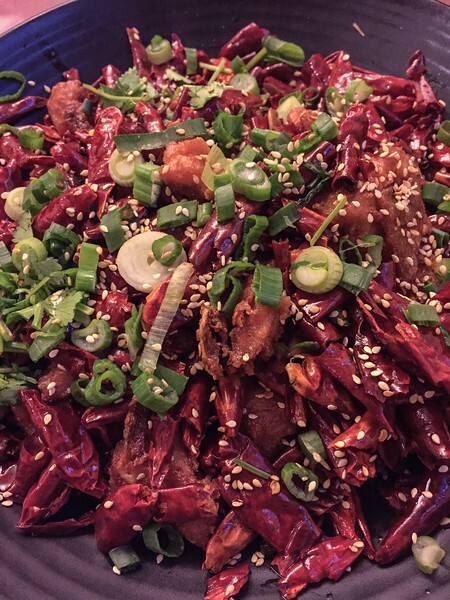 With multiple locations in the Greater NYC area, Joe's Shanghai should definitely be on your radar! You MUST go here to try the most amazing soup dumplings. This delicious little pockets of pork and cabbage are filled with a rich, boiling hot broth. A dozen of these is just what the doctor ordered after a long day of winter sightseeing in The Big Apple. The wait may be long, but it's soooo worth it. Ezme is a casual DC restaurant offering "homestyle" Turkish food in an environment as lively as it's location in Dupont Circle. The super chic interior, coupled with the hip atmosphere, made me feel posh, which is a rare thing. It was my first ever taste of Turkish food, and I've still yet to replicate the experience. Maybe a trip to Turkey is in my future? It's not hard to find a good meal in Louisiana, but, of course, I'm a little biased. But, in my opinion, Roberto's River Road Restaurant is everything that's great about Louisiana cuisine. The drive to rural Sunshine, Louisiana, is part of the fun, too. Catch the sunset along the levee, then follow it up with a great meal in a rustic riverfront shack. The culture and history of Cajun and Creole cooking, coupled with French traditions, invigorates the menu. Hint: you can't go wrong with the fish en papillote. Locals know: if you want good pizza in Rome, you go to Ai Marmi in Trastevere. Loud, busy and bustling, you immediately know you're in the right place. With authentic Roman pizza and delicious (and cheap) house wine, you can afford to feed an army and feed them well. I gorged on the eggplant pie, which I highly suggest. Having spent the greater part of the day yesterday in my friend's kitchen I've been reflecting about some of my greatest travel meals. This one at Ai Marmi in #Rome is high on that list. The unpretentiousness of this restaurant was surprising given the lovely marble topped tables and line to get in. Filled with local families and busting at the seams, this was the Rome I was hoping for! What makes a #goodmeal? When was your last good meal? I'd love to know! Tip: The eggplant pizza was out of this world good!!! Tucked away in the artsy Noailles neighborhood of Marseille, Cafe Vian is a quaint little mom & pop cafe. But don't be fooled by the casual, street-cafe style. The food is unbelievably delicious. Grab a curbside table to admire the graffiti and the local passersby. I'll never, ever forget the eggplant parmesan I had here: decadent, cheesy, and hearty. Add a glass of delicious of Bordeaux and you're set! My last, and most recent, mind-blowing food experience was in San Francisco's Chinatown. We lined up and waited for Z & Y for one of the most delicious, spiciest meals ever. The menu is full of traditional Szechuan dishes, including the three we ordered: Chicken with Explosive Chili Pepper, Wonton With Spicy Peanut Sauce and Tan Tan Noodle. Do yourself, and your sinuses, a favor and GO HERE! Tucked away in the quaint little town of McMinnville, Oregon, is Thistle, a "farm-to-table" treasure. The entire menu is seasonal and highlights the rich bounty of this beautiful state. The best pâté I've ever eaten was had here. Feeling brave? Let the chef take you for a ride with the "Chef's Whim" selection on the dinner menu. Be sure to check out some of the marvelous Oregon wines while nibbling your locally sourced salmon and pork. Don't Miss My other great Travel Guides! Since you asked, my last really good meal was Christmas Eve, in the Cantonese restaurant in the Grand Hyatt Hong Kong. Ten stories up, looking out over the harbor and Kowloon. And yes, the food was exquisite! Sounds like the food and the view were spectacular! Thanks for sharing! I’ve been to that restaurant in New Orleans and it was amazing! It’s hard to go wrong anywhere in New Orleans. We love stopping at mom & pop po’boy shops we haven’t tried yet. I think the best meal I’ve ever had was in the waterfront town of Oban, Scotland. I can’t even remember the name of the restaurant but it was fresh and delicious! I love those kinds of meals! They are so special and can never be duplicated. Glad you enjoyed my fav city, New Orleans. ? Recently, I was on a daylong press trip in Palafrugell, Spain to attend an annual arts festival. The highlight of the day, and my culinary travel experience, was our “lunch with the locals.” We sat at a single table with 100 locals that ran the length of the alley. It’s a dinner that only occurs once a year and is very special to the village. Everyone on the trip was seated at the far end of the table. As I was late to the lunch (lost the group during the city tour), I was seated towards the end of the group closest to the locals. Over several bottles of wine and a three-course dinner, I used my broken Spanish to make friends with those around me. We shared many laughs and a meal that was truly special. When we left, the teenagers next to me asked our tour guide if I could stay longer! Notice I mentioned nothing of the food. The food was good, but it was the people who made this experience. Wow, Bryan, that sounds truly amazing! Isn’t it incredible how important the company we keep can be when it comes to great meals. A good friend can make even a fishstick taste like fine dining! ?Thanks for sharing. Omg that sounds amazing! Have you posted about this? I could read about Peruvian food all day!